Theophrastus (1916). Hort, Arthur, ed. Theophrastus: Enquiry into Plants vol. ii. London and New York: William Heinemann and G.P. Putnam's Sons: Loeb Classical Library. Besler, Basilius (1613). Hortus Eystettensis, sive, Diligens et accurata omnium plantarum, florum, stirpium: ex variis orbis terrae partibus, singulari studio collectarum, quae in celeberrimis viridariis arcem episcopalem ibidem cingentibus, olim conspiciebantur delineatio et ad vivum repraesentatio et advivum repraesentatio opera. Nuremburg. doi:10.5962/bhl.title.45339. Retrieved 10 October 2014. Hale, Thomas (1757). Hill, John, ed. Eden, or, A compleat body of gardening: containing plain and familiar directions for raising the several useful products of a garden, fruits, roots, and herbage, from the practice of the most successful gardeners, and the result of a long experience. London: Osborne. Retrieved 3 November 2014. Narcissus (11 ed.). Encyclopaedia Brittanica. 1911. Retrieved 3 November 2014. Lloyd, David G; Barrett, Spencer C.H., eds. (1995). Floral biology: studies on floral evolution in animal-pollinated plants. New York: Chapman & Hall. ISBN 0412043416. Retrieved 29 October 2014. Rina Kamenetsky, Hiroshi Okubo, ed. (2012). Ornamental Geophytes: From Basic Science to Sustainable Production. CRC Press. p. 30. ISBN 1-4398-4924-2. Sell, Peter; Murrell, Gina (1996). "Narcissus". Flora of Great Britain and Ireland:: Volume 5, Butomaceae - Orchidaceae. Cambridge: Cambridge Univ. Press. pp. 285–293. ISBN 0521553393. Retrieved 29 October 2014. 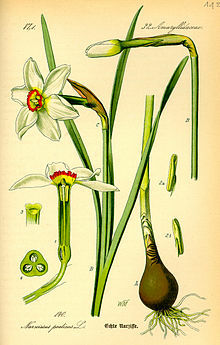 "Narcissus, in Flora of China: Vol. 24". p. 269. Retrieved 15 October 2014. "Narcissus". Flora of North America vol 26. Retrieved 19 October 2014. Webb, DA (1978). "Taxonomic notes on Narcissus L". Bot J Linn Soc. 76 ((June) 4): 298–307. Retrieved 23 October 2014. Graham, S. W.; Barrett, S. C. H. (1 July 2004). "Phylogenetic reconstruction of the evolution of stylar polymorphisms in Narcissus (Amaryllidaceae)". American Journal of Botany. 91 (7): 1007–1021. doi:10.3732/ajb.91.7.1007. Retrieved 30 October 2014. Barrett, Spencer C. H.; Harder, Lawrence D. (2 September 2004). "The evolution of polymorphic sexual systems in daffodils (Narcissus)". New Phytologist. 165 (1): 45–53. doi:10.1111/j.1469-8137.2004.01183.x. Retrieved 30 October 2014. Rønsted, Nina; Savolainen, Vincent; Mølgaard, Per; Jäger, Anna K. (May–June 2008). "Phylogenetic selection of Narcissus species for drug discovery". Biochemical Systematics and Ecology. 36 (5-6): 417–422. doi:10.1016/j.bse.2007.12.010. Retrieved 30 October 2014. Zonneveld, B. J. M. (24 September 2008). "The systematic value of nuclear DNA content for all species of Narcissus L. (Amaryllidaceae)". Plant Systematics and Evolution. 275 (1-2): 109–132. doi:10.1007/s00606-008-0015-1. Retrieved 30 October 2014. Marques, I.; Nieto Feliner, G.; Martins-Loucao, M. A.; Fuertes Aguilar, J. (11 November 2011). "Genome size and base composition variation in natural and experimental Narcissus (Amaryllidaceae) hybrids". Annals of Botany. 109 (1): 257–264. doi:10.1093/aob/mcr282. Retrieved 30 October 2014. Medrano, Mónica; López-Perea, Esmeralda; Herrera, Carlos M. (June 2014). "Population Genetics Methods Applied to a Species Delimitation Problem: Endemic Trumpet Daffodils (Narcissus Section Pseudonarcissi) from the Southern Iberian Peninsula". International Journal of Plant Sciences. 175 (5): 501–517. doi:10.1086/675977. Retrieved 5 October 2014. John M. Riddle, John M. (September 1985). "Ancient and Medieval Chemotherapy for Cancer" (PDF). Isis. 76 (3): 319–330. Retrieved 31 October 2014. Bastida, Jaume; Lavilla, Rodolfo; Viladomat, Francesc Viladomat (2006). Cordell, G. A., ed. "Chemical and biological aspects of "Narcissus" alkaloids" (PDF). The Alkaloids: Chemistry and Biology. Amsterdam: Elsevier Inc. 63: 87–179. doi:10.1016/S1099-4831(06)63003-4. Retrieved 31 October 2014. Kornienko, Alexander; Evidente, Antonio (2008). "Chemistry, Biology, and Medicinal Potential of Narciclasine and its Congeners". Chemical Reviews. 108 (6): 1982–2014. PMC 2856661 . doi:10.1021/cr078198u. Retrieved 31 October 2014. Pettit, George R.; Tan, Rui; Bao, Guan-Hu; Melody, Noeleen; Doubek, Dennis L.; Gao, Song; Chapuis, Jean-Charles; Williams, Lee (27 April 2012). "Antineoplastic Agents. 587. Isolation and Structure of 3-Epipancratistatin from Narcissus cv. Ice Follies". Journal of Natural Products. 75 (4): 771–773. PMID 22413911. doi:10.1021/np200862y. Retrieved 31 October 2014. Takos, Adam; Rook, Fred (31 May 2013). "Towards a Molecular Understanding of the Biosynthesis of Amaryllidaceae Alkaloids in Support of Their Expanding Medical Use". International Journal of Molecular Sciences. 14 (6): 11713–11741. doi:10.3390/ijms140611713. Retrieved 5 October 2014. Berkov, Strahil; Martínez-Francés, Vanessa; Bastida, Jaume; Codina, Carles; Ríos, Segundo (March 2014). "Evolution of alkaloid biosynthesis in the genus Narcissus". Phytochemistry. 99: 95–106. doi:10.1016/j.phytochem.2013.11.002. Retrieved 31 October 2014. Haworth, A.H. (1831). Narcissinearum Monographia (PDF) (2 ed.). London: Ridgway. Retrieved 20 October 2014. Erhardt, Walter (1993). Narzissen: Osterglocken, Jonquillen, Tazetten. Stuttgart (Hohenheim): E. Ulmer. ISBN 3800164892. Retrieved 18 October 2014. Zimmerman, Clayton (1994). The pastoral Narcissus: a study of the first idyll of Theocritus. Lanham: Rowman & Littlefield. ISBN 0847679624. Retrieved 19 October 2014. Schimmel, Annemarie (1984). Stern und Blume: die Bilderwelt der persischen Poesie. Wiesbaden: O. Harrassowitz. ISBN 3447024348. Retrieved 16 October 2014. Schimmel, Annemarie (1992). Two-colored brocade: the imagery of Persian poetry. Univ Of North Carolina. ISBN 0807856207. Retrieved 15 October 2014. Schimmel, Annemarie (1998). Die Träume des Kalifen: Träume und ihre Deutung in der islamischen Kultur. München: Beck. ISBN 3406440568. Retrieved 16 October 2014. Schimmel, Annemarie (2001). Kleine Paradiese: Blumen und Gärten im Islam. Freiburg im Breisgau: Herder. ISBN 3451051923.